"When I'm not writing..." with Angie Fox + giveaway! 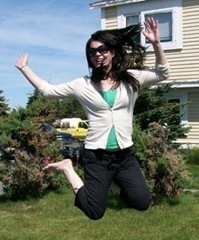 Our last "When I'm not writing..." guest post for the month is by Angie Fox! You may know her from her Accidental Demon Slayer series but she's here today to promote IMMORTALLY YOURS and the upcoming IMMORTALLY EMBRACED, the first two books in her new Monster M*A*S*H series. It's set in a paranormal M*A*S*H unit and is sure to appeal to fans of Molly Harper and Kerrelyn Sparks. 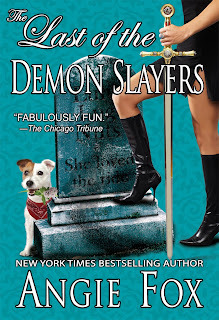 Enjoy the post and make sure to stick around for the giveaway to win your own copy of any one of her Accidental Demon Slayer books! Thanks for having me on the blog! I’ve enjoyed reading the other “When I’m not writing” posts and am glad to join in. 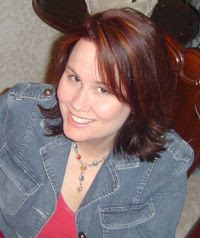 My name is Angie Fox and I write paranormals that feature demon slayers and biker witches. In my spare time, I get to research all the fun things I write about in the books. Let’s just say it’s been an adventure. I’m a wife, a mom and one of those people who can be a little shy at times. To the point where I never predicted my writing would put me on the back of a coal black Harley Davidson, with an Irish Setter in tow. I’d set out to write a paranormal about a straight-laced preschool teacher turned demon slayer who has to run off with a gang of geriatric biker witches. But my heroine has a smart-mouthed dog that, thanks to her new powers, can talk…and talk…and talk. And I really loved that dog. What’s a writer to do? 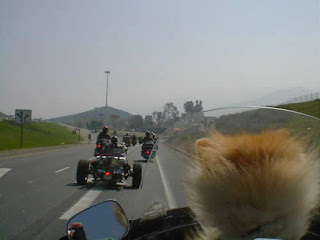 Well, I went online and learned that there is a nationwide club of Harley bikers who ride with their dogs. So my heroine could have her pink Harley, and her Jack Russell Terrier too. And of course I had to meet these Harley riding dog lovers. I called up a few of the members of a Biker Dogs Motorcycle Club and the fun began. They’ve invited me into their homes, introduced me to their dogs and, like my heroine, the bikers have hoisted me up on the back of their Harleys, with dogs in tow. Stone, the biker who has spent the most time making sure I don’t fall off his hog has even invited me to some biker rallies (note to self: don’t wear pink next time). Another one of the bikers I’ve met has a wife who is a biker witch. (And here I thought I was making this stuff up). Every time I go out with the bikers, I find fun little touches to add to the books. Plus, it’s a blast. So if you ever see me heading down the highway, wave. And I’ll do the same. Thanks for stopping by, Angie! What a great post! For more information about Angie and her books, check out her website or follow her on Facebook or Twitter. IT’S EVERY GOD FOR HIMSELF. 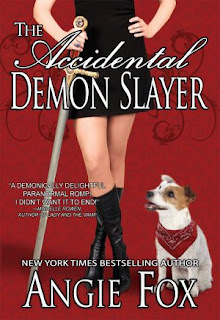 Angie is graciously providing one (1) lucky winner with a copy of his or her choice of a book of her Accidental Demon Slayer series! Thanks, Miki. 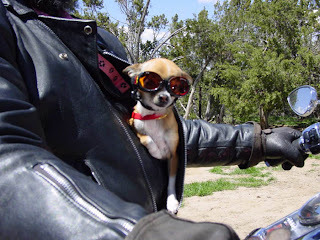 Believe me, I had no plans for hanging with biker dogs when I started the series! But now, I can't imagine life without them. Thanks for the fun post!! I loved Immortally Yours!!! Congrats to Angie on the newest release and I can't wait to get my hands on it : ) Ummm... I bought my dog a snow suit cuz he's got practically no hair and we get snow here. He doesn't really mind it and looks so cute! Oh, how cute! What kind of dog do you have? I tried to buy my poodle some boots once. I was able to get them on her, no problem. But she refused to walk in them. She'd just stand there and look at me, like, "Are you done yet?" Thank you for such a great post! I was always an over protective pet mommy and never did anything really out there. I love the photos in this post. What happy puppies :). They dogs are so cute when they're about to ride. They get super excited. One of the bikers said, "Well, think of it this way. Dogs like to have their heads out the car window. On a motorcycle, it's like they get to do that with their entire bodies." When the kittens were very young, they would go trucks and bikes were abundant. If they were not cars, outside and I would be worried sick,home by 9pm I would send my husband out witha bag of treats to find them and entice them back to the house. And you know a bag of treats always works. My dog tries to get out of the house now as a game. She's not trying to go anywhere. She just knows we'll have to lure her back into the house with goodies. Aww...what a sweetie! When we were kids, we used to get into the dog house with Rex, our German Shepherd, but he never let us ride. I haven't really done anything crazy with my pets but my cat Teddy loves being chased outside even in the winter..Thanks for the awesome giveaway! Glad to do it! Teddy reminds me of my neighbor's cat, who likes to be chased. She'll stop and meow if you dare find something else to give your attention to (say, like the other neighbors). Then there's the neighbor's cat who will walk on a leash. I didn't believe that one until I saw it for the first time. I've never done anything crazy with my cat, but I loved reading about your biker experience. Thanks for the giveaway. I love the dogs. Those pictures made my morning. Is there anything sexier than a biker and a puppy together? I know! I love them, too. 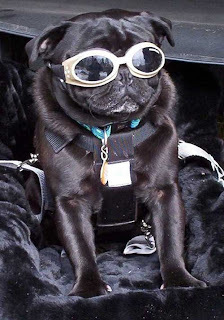 And those little dog biker glasses they wear are called, "doggles," which totally cracks me up. I have cats, doing anything crazy with them would only get me sliced up. I tried to dress them in doll clothes when I was really little. It was not a success. 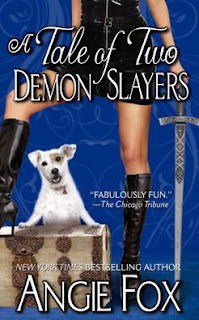 Love Angie's Demon Slayer series, definitely interested in the new one. Good for the cats! I used to dress up my white poodle when I was a kid. He was about the size of my Snoopy stuffed animal (who had clothes). Poor dog. I look back on the pictures now and I'm a kid, all proud. And there's my doggie, with this look on his face like, "I know how stupid I look." Our dogs always liked to play tug of war with an old sock. Well, I fostered a raccoon when I was a teen because her mother was killed. I kept her for about a year until I found a safe place for her to live. I started feeding her with a bottle. She and my little dog were BFFs and played and wrestled. I worked at McDonald's at the time and they became addicted to the animal cracker cookies. I had to bring them home a box at least a few days a week, lol. That is so cute! How big did she get? I used to walk my kitty on a leash around the townhouse complex where I lived. That's about as wild as I've ever gotten with my pets. The kitty on the leash cracks me up every time. I about fell over when one of my neighbors started doing it. The cat enjoyed it, too. She got out of the house, got some attention. It was all good. I haven't done anything wild with my dog.